Fans that attend this weekend's Glenora Wine Cellars U.S. Vintage Grand Prix presented by Welliver McGuire will not be disappointed with the wide variety of vintage racecars that will be in attendance. This weekend the track expects over 400 entrants to hit the track - making it one of the largest vintage racing events in the country. This highly-anticipated weekend combines the best in vintage racing on the 3.4-mile road course at The Soul of American Road Racing with a special tribute to the racing career of Elliot Forbes-Robinson, and the Antique Auto Show presented by Chemung Canal Trust Co.
Don't miss the Chemung Canal Trust Co. Antique Auto Show on Saturday, where fans can display their antique cars in friendly competition and take a parade lap around the historic track on Saturday afternoon. Tickets for the auto show are $70 and include one three-day general admission ticket, vehicle entry into the show, a parade lap, and a special gift. Participating cars must be at least 25 years old and the show is limited to the first 400 entries. Race fans have the opportunity to root for fellow New York State drivers, with over 70 cars being handled by a driver from New York State this weekend. Scott Welliver from Hector NY will team up with WGI's honored guest, Elliot Forbes Robinson in the first Enduro at 10:45 AM on Saturday, driving a 1992 Porsche 964 Super Cup. Corning's Marc Giroux will drive double duty in groups 2 and 9 in a Brabham BT29 as well as a Lola T97/20. Watkins Glen native Rick Hughey will be driving his 1963 Formcar (F/V) around the twist and turns with group 1. Welliver is also this weekend's sponsor for the vintage racing event at the racetrack. 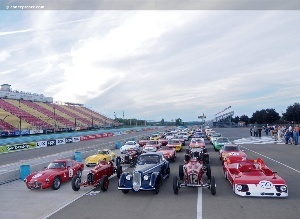 Over 40 Alfa Romeo cars will be making their mark at WGI in 2010 during the Vintage weekend. Alfa Romeo cars this season date all the way back to 1932 to the more recent versions in 1988. Over 40 Alfa Romeo cars will take on all the twist and turns the legendary road course has to offer. MG tradition continued this September with SVRA's 26th running of the historic 'Vintage Collier Cup' all MG race at Watkins Glen, New York. The weather cooperated to give 33 MGs - of all ages and models, from MGTC's to MGB-GT V-8's - a wonderful go at this year's Collier Cup race on the Glen's 3.4 mile winding road course, to the thrill of thousands of spectators and MG enthusiasts. Top honor went to MGB-GT V8 racer Les Gonda who was voted by his racing peers to receive the prestigious SVRA 'Vintage Collier Cup'; Mike Barstow racing his 1953 MGTD received the MG ‘T' Cup (1st MG-T); Todd Treffert with his 1961 MGA was awarded the Bucher-Decker Cup (1st MGA); Charles Guest racing his 1967 MG Midget received the Bill Glanville Cup (1st MG Midget) plus the Cornett Trophy for the 1st overall MG.
As the MG vintage racing scene for 2010 is winding down, MG racers are now turning their focus to two particular MG Vintage Racers' designated 'Focus Events' for 2011. First will be their Focus Event West, with CSRG at Infineon Raceway in California, the weekend of April 8-10. Then in September their designated Focus Event East, will be in Connecticut at Lime Rock Park's Historic Festival, Labor Day weekend. More information on these events, and on the MG Vintage Racers, can be found on their Website: MGVR.org. Plenty of corks were popped as over 400 racecars rolled into Watkins Glen International (WGI) for the Glenora Wine Cellars U.S. Vintage Grand Prix (USVGP) this past September 10-12. Presented by Welliver McGuire, Inc., SVRA once again hosted what has simply become one of the country's largest vintage auto racing gatherings. Scheduled were the organization's normal program (including a Pre-war/Allard group) of Optima Battery group sprint races, pair of Michael Stott-UBS endurance challenges, traditional, All-MG Collier Cup, and New York Governor's Cup. As noted by Competition Director, Carl Jensen, 'nearly 60 Alfas were also on hand this year' for the special feature All-Alfa Romeo shootout. Complimented by three days of premier vintage road racing, the hamlet of Watkins Glen hosted the 18th Annual Grand Prix Festival sponsored by Chemung Canal Trust Company. As in the past, Friday's main dilemma was choosing to enjoy either the blacktop action at WGI, or the GP festivities in Watkins Glen proper. I once again chose the latter. So leaving a full chorus of practice and qualifying sessions singing loudly at WGI, I traversed down the sandstone cliffs overlooking Watkins Glen village for a full day of celebrating the rebirth of post-World War II American road racing. Starting with the reenactment of tech inspection at Smalley's Garage (original home of tech), residing on Franklin Street, the inaugural 1948 street race's straightaway, the all-day party would continue with a judged Concours d'Elegance; the festival's time-honored historical dialogue entitled, 'The Legends Speak;' 'Drivers Walk of Fame inductions; and needless to say, plenty of vendors selling food, artwork and racing memorabilia. USVGP Grand Marshall and special guest, EFR (Elliott Forbes- Robinson) was just one of the former Glen drivers selected into the class of 2010's 'Walk of Fame' this weekend. This honor is represented by a granite marker embedded in one of the town's pedestrian walkways. With the GP Festival and SVRA both honoring 100 years of the Alfa Romeo automobile, it was fitting that the Glen's initial street battle was won by Frank Griswold's 1938 Alfa Romeo 8C 2900B, a static beauty that posed for an up-close assessment. Additionally, approximately 28 variants of Sidney Allard's creations were also in full view throughout the day and weekend. The day culminated with the roar of selected machinery entering Franklin Street for the crowd's inspection before the ageless mechanicals accelerated for a couple of controlled 'hot laps' around the original 6.6-mile street circuit. The entire road course was lined with cheering spectators circa 1948. Beautiful late-summer weather welcomed everyone as Saturday began with more qualifying action on the blacktop, and the event's first formal battle, the enduro for faster cars. Forty-five speedy battlewagons took the green flag, and podium regular, Travis Engen's Audi R8 was first to see the checkered flag. Holding the lead for only several laps, the 1988 Argo JM19c of Baughman/Domeck, took second. There was no rest for the weary as a gaggle of always highly contested qualifying races took to the asphalt. Finishing late in the day, the track was free for the Morris Garage (MG) warriors to engage in their 26th Collier Cup battle. Grabbing an early lead, Charles Guest's MG Midget fell victim to Les Gonda's powerful V8 for only a couple of laps before Charles reclaimed the lead and victory.